This entry was posted on 26 April 2017 by Filippo Bradaschia. 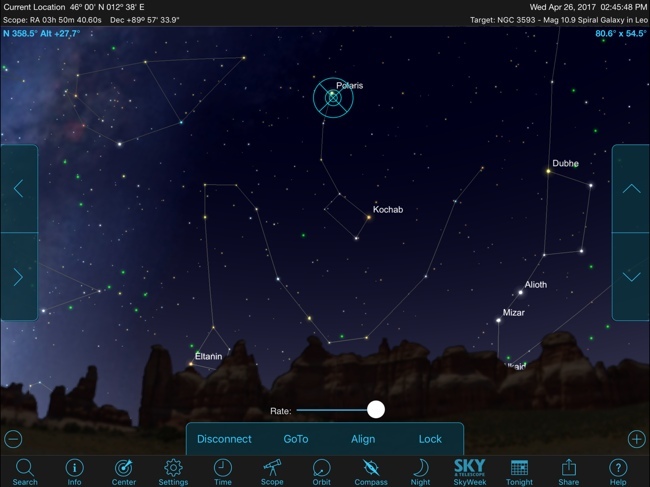 With SkyFi III, connected to EAGLE CORE, you can control many mount (like SkyWatcher or Orion) using the SkySafary planetarium app, you can start autoguiding and capturing with DSLR camera using EAGLE OS software, in order to easily perform astrophotography via WiFi from any iOS or Android smartphone or tablet! 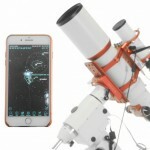 Usually SkyFi III creates its own WiFi network that you connect to but in this article we'll see how to connect it to EAGLE CORE: this way you can connect your iOS or Android device to EAGLE CORE WiFi and take full wireless control of the telescope that will be easier to use and transport, a perfect instrument for astrophotography. 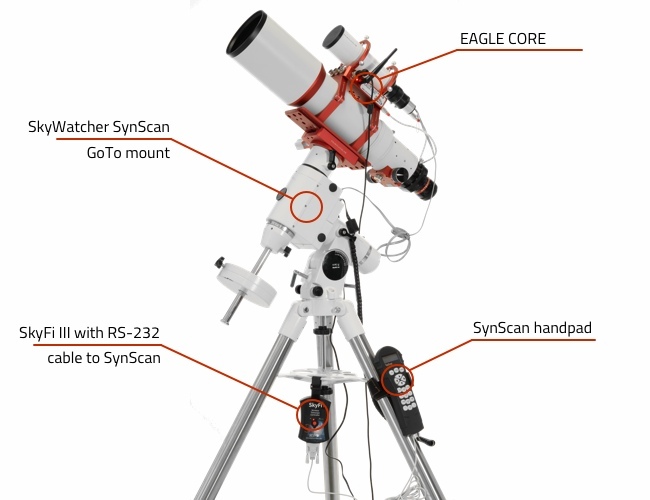 In this example, we'll see how to set SkyFi III connected to a SkyWatcher computer mount with SynScan, but you can use this article to control other mounts too, those compatible with SkyFi III. Take the RS-232 cable that normally is used to connect the SkyWatcher mount to the control computer. We connect it to the bottom port of the SynScan handpad and then to the serial port on the bottom of the SkyFi III. Then we turn on the SkyFi III by pressing the central ON button, we power the SkyWatcher mount and turn it ON it by pressing the ON button on the mount itself. 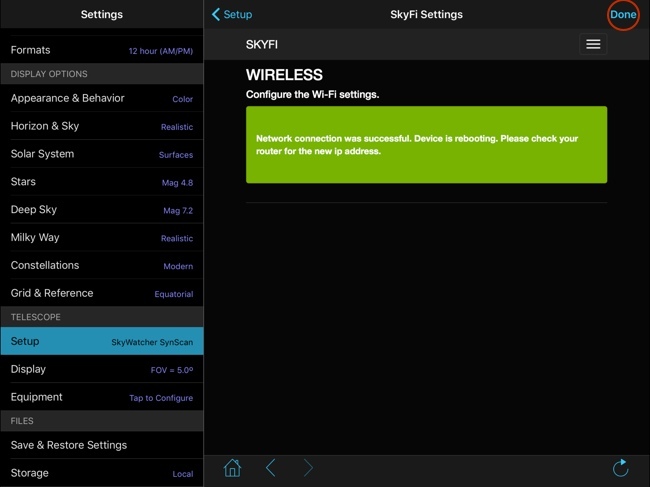 Then we activate the WiFi of the mobile device from which we want to control our telescope (in our example, an iPad or an iPhone) and select the network created by SkyFi. Then start the SkySafari app (Plus or Pro, if you haven't it, you can find it in the App Store for iOS or the Google Play Store for Android). Then select the Settings button at the bottom, and then Setup. The following screen will appear. 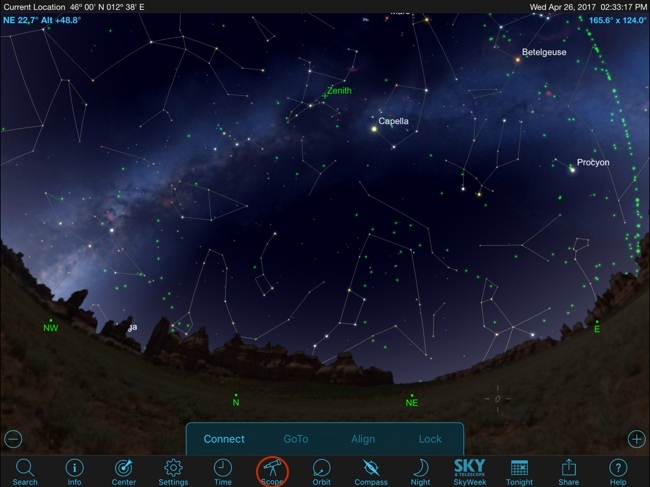 Click Scope type and select SkyWatcher SynScan (then press < Setup to confirm). Then click Mount type and select Equatorial GoTo (German) (then press < Setup to confirm). 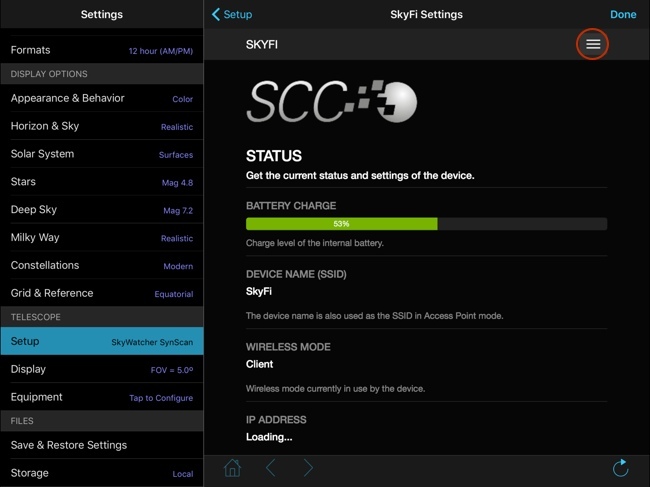 Then press the button corresponding to option Auto-Detect SkyFi. 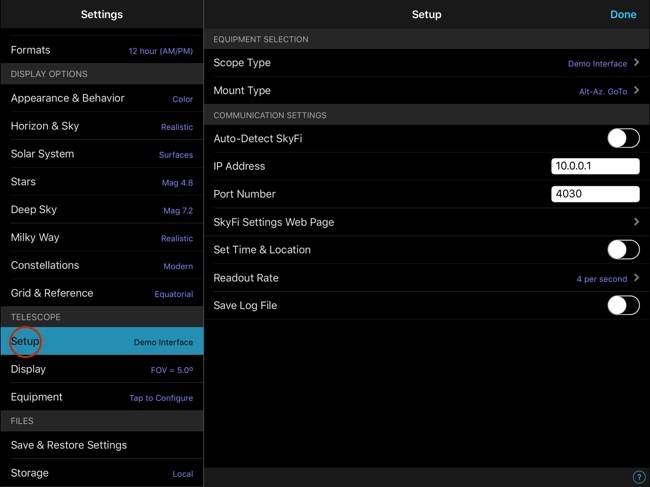 Now press the SkyFi Settings Web Page. The window shown in the image below will open. Press the button on the top right and select WIRELESS. Click the WIRELESS MODE option and select "change network". In the SCANNED NETWORK option, select the network name created by your EAGLE CORE (in our example, the network is called "eaglecore005"). Then, in the PASSWORD option, enter the network access password created by EAGLE CORE. Then, at the bottom of the page, click the APPLY SETTINGS button. Now wait until the textDevice has been configured, connecting to network... appears then, if the parameters have been entered correctly, after a while, the message "Network connection was successful. Device is rebooting. Please check your router for the new ip address" will be displayed. Now press Done button at the top. Now access the WiFi settings of your control device and connect to the WiFi created by EAGLE CORE, in our case the network called "eaglecore005". Then go back to the SkySafari app and press the Scope icon, and then Connect. Now you can move the mount, align the stars in the sky, point one of the visible objects on the planetarium. Then you can go to the EAGLE CORE app to start the autoguide and then photograph the object you've been selected with SkySafari.